The Federal Solar Tax Credit is one of the biggest incentives for installing a solar energy system. It is available to residential and commercial systems alike and can be used to save thousands with no maximum cap – which is excellent if you have a high energy demand. 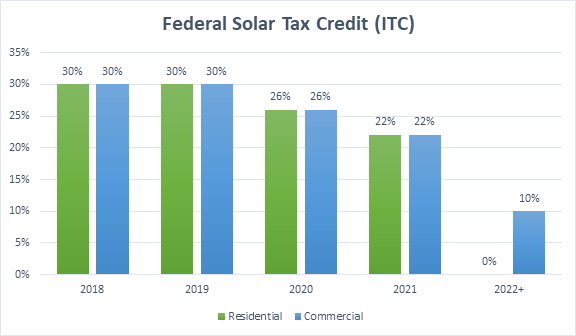 The Federal Solar Tax Credit aka the investment tax credit (ITC), allows customers the ability to deduct 30 percent of the cost of installing a complete solar power system from their federal tax bill. The credit was created to help Americans invest in solar and incentivize other renewable energy solutions. The credit is a dollar-for-dollar reduction applied to your federal income tax liability, (this has been considered a monumental incentive for homeowners to go solar). The credit has helped annual solar installations grow by over 1,600 percent since its implementation in 2006. If you purchase a system outright and have it installed on your property for the use of the home or business, then you can reduce 30% of the system cost from your tax burden. So, a $15k dollar system essentially becomes $10k after projecting the credit onto the final cost of the system (including installation). Am I eligible for the solar tax credit? For leased vs. purchased systems: Most homeowners are side swiped when leasing a system, as they are unaware that you must own the system outright rather than lease. Often, the company signing a lease with the homeowner takes the solar tax credit and files it through their company – essentially absorbing the value from the homeowner into their organization. This is another reason why owning your system outright has more benefits. If you don’t have enough tax liability to claim the entire tax credit the year the system is place into service, the federal government does give homeowners the ability to roll over the credit into future years tax liabilities, (assuming the solar tax credit is still in effect). Remember: We are a solar company, not tax accountants. We try to provide accurate, quality and reliable advice. However, please check with an accredited professional to confirm accuracy and eligibility before filing. How long will the tax credit be available? Since the initial ITC was created along side the recovery act, the solar rebate was designed to be a temporary credit offer from the federal government. Currently the credit grants a 30% incentive for 2018 and 2019. However, the credit will begin to phase out from that point, and is reduced to 26% for 2020, then 22% for 2021, and 0% (residential) 10% (commercial) for 2022. The rebate covers such a large percentage of your total system investment, this plays a major factor in going solar before 2020 for the full credits effect. Although homeowners can still capitalize on the federal solar tax credit before 2022 and get a substantial refund. Essentially, we have five more years to utilize this powerful incentive, and then only commercial systems will be eligible for a 10% tax credit for 2022 and beyond. *Remember, to claim the tax credit all systems must be placed in service before each year’s end. However, getting the 30% credit will only be available for one more year, until 12/31/2019. How do you claim the solar federal tax credit? First off, remember that every cost you have in going solar may be applied to the final system cost (with installation). So, record every transaction and save every receipt, because the more you spend in total on your system, the higher the credit can go with no maximum. Everyone purchases and installs their solar power systems differently, so costs and fees will vary per customer. Also, for DIY homeowners, hiring a contractor may also be claimed and deducted for the rebate. If you decide to install the system yourself, you will not be able to claim the cost of your own labor on the credit. Collect all your invoices and receipts and fill out IRS Form 5695. You will need to confirm you are eligible for the tax credit. Generally, this means if you own the system and owe income taxes, then you most likely will be able to claim the tax credit. Consult with your tax accountant if you’re not sure. If you are using TurboTax or QuickBooks, then you should be able to file the form using their instructions. If you are doing this manually, then you need to complete the form per the IRS instructions for Form 5695. Once that’s complete, add Form 5695 to your Form 1040 and submit, and your done filing. We at Solaris try to provide quality information and products, with affordable pricing for homeowners and installers. If you need any assistance with designing a solar power system, or how to get started with permitting send us a contact form with as many project details as possible. We are happy to work with you and help guide you through the process of going solar! » ​Is DIY Solar Worth the Investment in 2019?